The Comfe Hands will come in a beautiful design which is good enough to compliment the iPad without taking any glamour away from Apple’s design and engineering team. It uses a specially engineered surface which paves the way for a firm, no-slip hold, and the intuitive push-on construction is able to fit on any side, being a snap to use. In addition, Comfe Hands will double up as an incline stand, and can also function in a third role – that of a vertical stand. If you want to stretch your imagination a little bit further, then this puppy will quadruple up as a protective bumper with one on each side. Since organic shapes are always easier to grasp with our human hand, the Comfe Hands takes the same route, turning the painful pinch grip into a power grip. 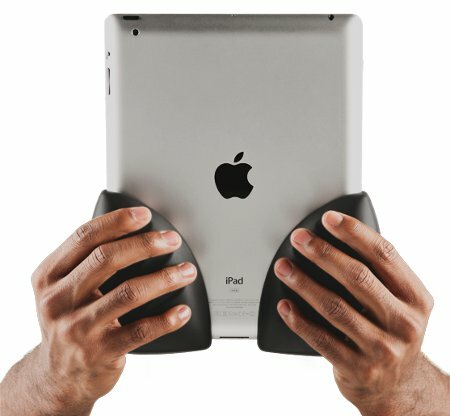 Similar to human skin, Comfe Hands is soft to the touch, and it certainly makes the iPad more well-endowed. It does not matter if you want to use the Comfe Hands at a desk or in the kitchen, life will still be easier in the end, and your iPad will not lose its style.